A book nearly 60 years in the making has been published by longtime Grace Brethren pastor W. Russell Ogden, Ph.D. 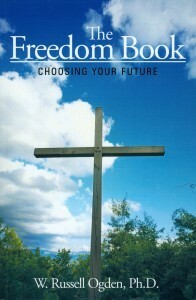 Entitled “The Freedom Book: Choosing Your Future,” the 312-page paperback is now completed and available for shipping. Ogden includes the Grace Brethren church in Lanham, Maryland, in his dedication, where he served 18 years as pastor before retiring to live in Indianapolis. In his preface, Ogden relates the presentation of his senior monograph as a senior student at Grace Theological Seminary in the spring of 1953. The scripture he chose for that project was Ephesians 1:4, “Even as [God] chose us in [Christ] before the foundation of the world” (American Standard Version, 1901). Noting that the passage is a strong statement of the twin doctrines of election and predestination, Ogden says that in succeeding years he has examined and re-examined his exposition of the Scripture and ultimately he reversed the position he defended in the monograph. The book is divided into three main segments. Part 1 is “Finding Your Focus,” Part 2 is “Viewing the Terrain,” and Part 3 is “Making Up Your Mind.” Several helpful appendices conclude the book, including a summary of both Martin Luther’s and John Calvin’s scriptural support of election and predestination, a helpful glossary of terms, and an extensive bibliography. Retail price of the book, which was published by WestBow Press with the ISBN 978-1-4497-21650-7, is $22.95 plus shipping and handling. However the author is making a special offer of $19.50 per book (plus shipping and handling) for orders received before November 30, 2011. For more information contact the author at russogden@att.net, call (317)849-5621, or mail orders (checks made out to Regents Enterprises) to Regents Enterprises, 7160 Larkshall Road, Indianapolis, IN 46250-2847.